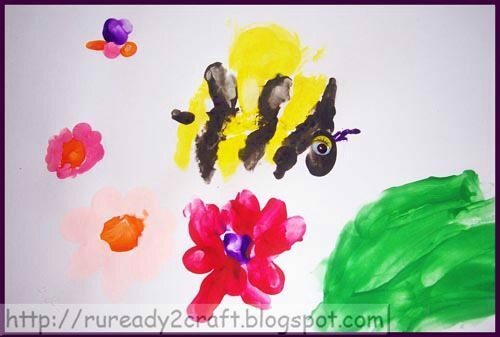 Handprint Busy Bee Craft – Guest Post from R U Ready 2 Craft? Hi everyone! I am Leslie @ruready1st and today I am going to share a Handprint Busy Bee craft with you made with prints from the top of the hand! Last week, my girls were at Veritable Boredom Solution (aka Vacation Bible School) for summer break where they are doing a bug theme. It inspired some bug activities at home. After I got them to stop buzzing around the house, I mentioned that we could fingerpaint and it immediately got their attention. My girls love to paint! Step 1. Make a fist with thumb on the side of the fist like the letter ‘A’ in sign language. Step 2. 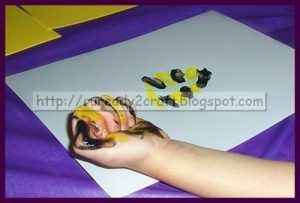 Paint the side of the thumb black and each folded finger an alternating color of yellow and black. Step 3. Press freshly painted fist onto the paper. Step 4. The handprint may not be complete. If you like, you can use thumbprints or fingerprint to fill in the spaces. Step 5. 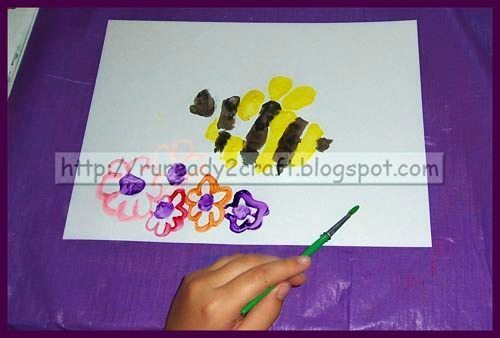 Fingerpaint the wings onto the bee. Step 6. Affix a googly eye.Step 7. Use a toothpick draw out the antennae. My youngest loves to fingerpaint and enjoys handprint art. She will do anything to get her hands into paint. My oldest daughter prefers using a brush. After making the initial handprint with her fist, she washed her hand off. She then finished her picture off by using a brush. 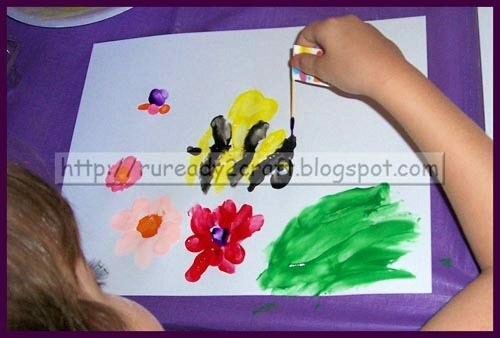 Whichever method your child prefers, it is still a fun thing to do. 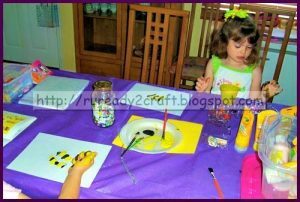 I am a Stay At Home Mom who enjoys doing new and different crafts with my girls especially since it keeps them away from the television. We started as a part of homeschooling with me documenting the fun on my regular blog. 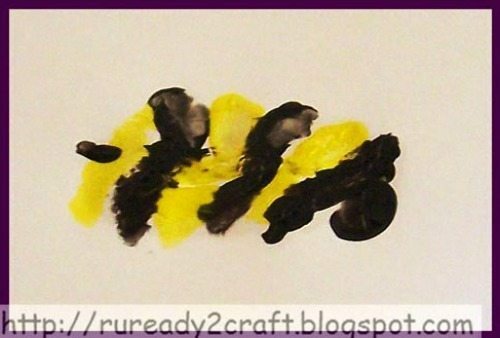 Now I have started a new adventure with my craft blog, RU Ready 2 Craft? I look for inspiration in what they are doing each day to include in our crafts. 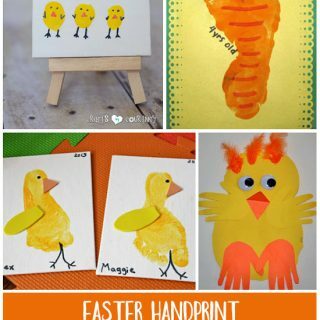 Love this unusual take on handprint art. Very cute! 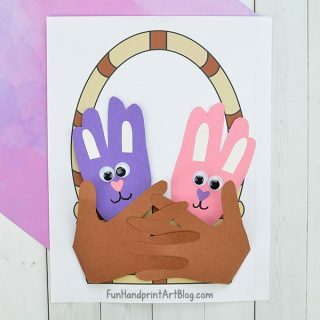 I have a Bugs ABC’s Blog Hop that I would like to invite you to explore and possibly linkup your post. The ABC’S stands for Activities, Books, Crafts, and Snacks ~ all about bugs! I really think your bee idea would be a perfect addition to our hop. I hope you will stop by my blog.